Morley is not an unusual surname, ranking 334th in a 2002 ONS surname survey of England and Wales. With a count of 21533 persons (or 20026 after the recommended 93% correction factor) it places immediately below Whittaker, Davey, Birch, Bartlett, Kent, Macdonald, Cartwright and Howell; and immediately above Daniels, Skinner, Glover, Goddard, Pugh, Humphries, Mahmood and Bowen . This abundance is not surprising, as it is not an uncommon place-name either, found as far apart as Devon (as Moreleigh), Durham, Cheshire (as Morley Green, just south of Manchester Airport), Derbyshire (just northeast of Derby), Yorkshire (a bedroom community of Leeds) and Norfolk (the sister villages of Morley St Botolph and Morley St Peter, as well as nearby Swanton Morley). While today not the most prominent settlements, both the Yorkshire and Derbyshire locations lent their name to their respective historical county subdivisions (more recently known as Agbrigg & Morley wapentake, and Morleston & Litchurch hundred). It should therefore not be surprising that both counties have high historical abundances of the surname. The Morley division of Agbrigg & Morley encompassed the vicinity of Morley, Yorkshire (but not Morley itself!) as well as parts of Batley, Birstall, Bradford, Calverley and Dewsbury parishes . Morleston & Litchurch was comprised of the area immediately north of Derby including the civil parish of Morley . The above evidence, while hardly comprehensive, should be enough to discredit any notion that all English Morley families share a common origin for their surname. Stated differently, it is unlikely that all Morleys descend from a shared patrilineal ancestor. Preliminary genetic evidence supports this notion. It would even be overly simplistic to presume that all Morleys in West Yorkshire (or any other such region of concentration) received their surname from the same source. The English gradually adapted permanent surnames towards the late Middle Ages. This allows for much surname diffusion over the subsequent several centuries of migration. See  for the 1881 and 1998 distributions of the Morley surname in Great Britain; the former year is more representative of the historical distribution (although clusters in large population areas such as London and Manchester are comparatively recent developments), while the latter year is representative of the present distribution. To illustrate this point: consider the patrilineal origins of the present-day Morleys living in the Calderdale region of West Yorkshire. Some descend from a Morley living in that area in the 1730s. Others descend from Morleys that migrated from Hinderclay/Bressingham, Wakefield and Knaresborough in the middle of the nineteenth century. The second group now probably outnumbers the first group. Complicating matters further, the ﬁxed spelling of a person’s surname is a relatively recent development. For instance, as an extreme example, the surnames Malyn, Marley, Marleye, Marlin, Marly, Marlyn, Marlo, Marloe, Marlow and Morley are all thought to have been used in contemporary references to Elizabethan playwright Christopher Marlowe . As a more recent example, a very preliminary search of census and church records seems to indicate that the American author Christopher Darlington Morley (with roots in Woodbridge, Suffolk) descends (through his father Frank Morley, grandfather Joseph Roberts Morley and great-grandfather William Morley) from one Reynolds Marley of Woodbridge, Chevington and Bury St. Edmunds. More recently, Morley has also been adapted by some Irish families as an Anglicisation of Ó Muraíle and similar Gaelic surnames. With all this in mind, it would not be surprising if Marley, Yorkshire (situated between Bingley and Keighley) also contributed to the local Morley population. Also of interest is Mearley, Lancashire (called Merlay in 1241; Merlee in 1272; Merleye in 1302 and Morleye in 1306 [5, 6]), which is believed to have lent its name to various Morleys in Blackburn Hundred, as well as the owners of the manor at Wennington [5, 7]. We also note the existence of a Morleys Hall in Astley, Lancashire; early fourteenth-century residents here styled themselves as ‘de Morlegh’ , but so far there is no evidence yet of this byname persisting and being adopted as a permanent surname. For completeness, we also mention Marlow, Buckinghamshire. perform a Y-DNA comparison between families. Note: These are static images, last updated in December 2015. See the Morley Interactive Surname Map for up-to-the-moment information. Base map from Google Maps. This map makes use of data provided by the Historical County Borders Project. Base map from Google Maps. 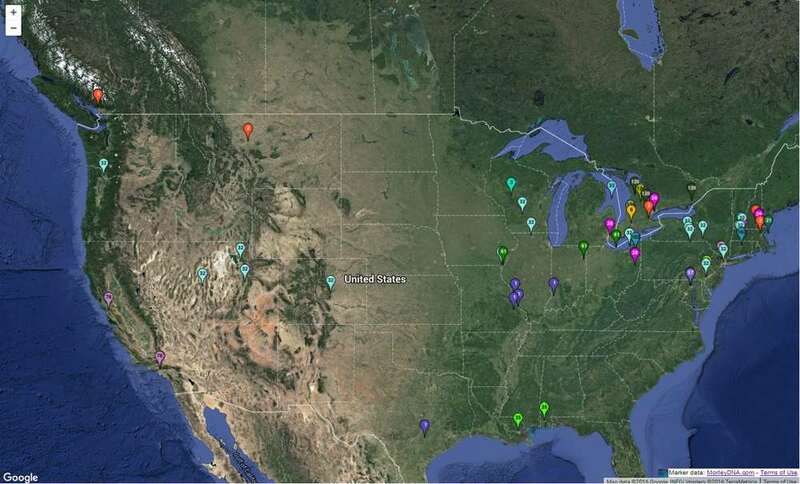 These maps depict the various English and North American Morley family groups (color- and numerically-coded) being studied (to varying extents) by the project administrator. 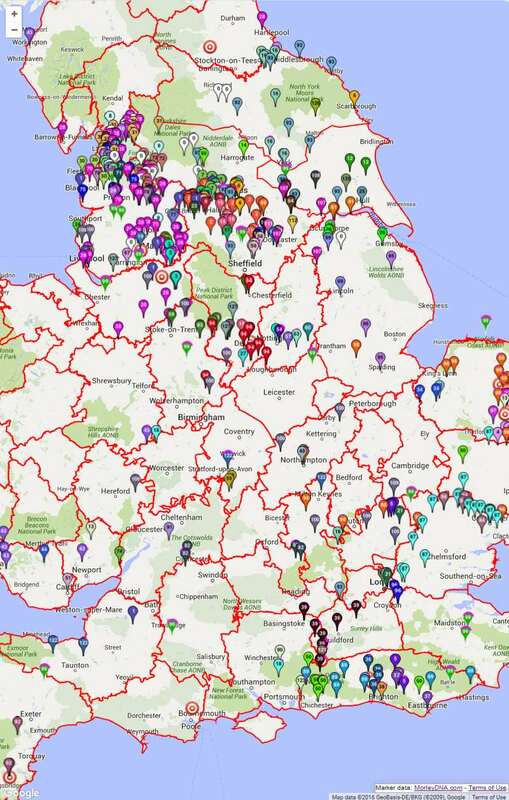 These maps are not representative of the historical distribution of the surname, and it indicates that the project administrator's efforts to actively recruit project members will be skewed toward Morley families from Northern England. Interested in helping recruit test candidates for Morley families from other areas? Please contact the group administrator. See here for an interactive, worldwide version of these maps. Ofﬁce of National Statistics, Surnames of England and Wales - the ONS list, via http://www.taliesin-arlein.net/names/. John Palmer and Anna Powell-Smith, Domesday map, http://www.domesdaymap.co.uk/. Abstract of the answers and returns made pursuant to an Act passed in the ﬁfty-ﬁrst year of His Majesty King George III, intituled,“An Act for taking an account of the population of Great Britain, and of the increase or diminution thereof”: preliminary observations, enumeration abstract, parish register abstract, 1811, 1812. Peter Farey, The Spelling of Marlowe’s Name, 2002-2004, http://www2.prestel.co.uk/rey/names.htm. William Farrer and J. Brownbill (eds. ), A History of the County of Lancaster, vol. 6, ch. Townships: Mearley, pp. 375–379, 1911, http://www.british-history.ac.uk/report.aspx?compid=53135. William Farrer and J. Brownbill (eds. ), A History of the County of Lancaster, Victoria County History, vol. 8, ch. Townships: Wennington, pp. 207–209, 1914, http://www.british-history.ac.uk/report.aspx?compid=53300. William Farrer and J. Brownbill (eds. ), A History of the County of Lancaster, vol. 3, ch. Townships: Astley, pp. 445–449, 1907, http://www.british-history.ac.uk/report.aspx?compid=41365. Paul Longley et al., Great Britain Family Names, Public Profiler, http://gbnames.publicprofiler.org/.